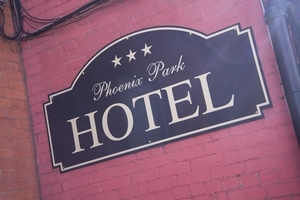 "I had a good stay in phoenix parc hotel. I would stay there again. Very friendly peopel. " "Good staff and good location. " " We found the hotel to be brilliant for our needs. The chap on reception a Brazillian was fantastic. "Excellent value. Staff friendly and helpful. " Phoenix Park Hotel Dublin is a fully accredited Failte Ireland 3 star family run hotel which has recently gone under huge renovation in conjunction with the hit TV show ‘At Your Service’! We have met the high standards for inclusion in the Irish Hotels Federation guide and are also inspected and rated by the Irish Tourist Board – Bord Failte. We are situated directly beside the Phoenix Park and 3 minutes walk from Heuston train station(direct link to Dublin airport), Dublin Zoo, Luas Tram system, Bus stop, New court building (CCJ) , Gardaí Head Quarters, Department of Defence, Ryan’s Pub, Nancy hands bar and restaurant. We are 15 minutes or less from the Guinness store house, St James hospital, City Centre, Temple Bar, Grafton Street, Brazen Head Pub(oldest pub in Dublin), Kilmainham Gael. Click below to view more images of the Hotel.